Father, we are filled with the new light by the coming of your Word among us. May the light of faith shine in our words and actions. Grant this through our Lord Jesus Christ, your Son, who lives and reigns with you and the Holy Spirit, one God, for ever and ever. Amen. Christmas Folk Song: Shepherds, Up! 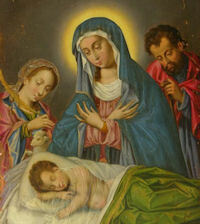 Today the Church celebrates the Birth of Jesus Christ, the first day in the octave of Christmas. Throughout Advent the Church longed ardently for the coming of our Savior. Today she celebrates His birth with unrestrained joy. "The Word was made flesh and dwelt among us." The Son of God became man to give us a share in that divine life which is eternally His in the Blessed Trinity. Christmas time begins on December 24 with the first Vespers of the feast and ends on the feast of the Baptism of Christ. White vestments reappear in our churches as a sign of joy. The Christmas feast is a festival full of joy. The Eternal Word has become Man and dwells among us. The longings of the patriarchs and prophets are fulfilled. With the shepherds we hurry to the manger and adore the Incarnate Son of God, who for us and for our salvation descended upon earth. 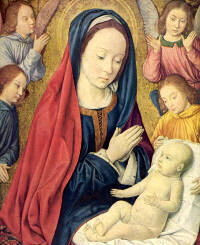 The purpose of the Christmas feast is beautifully expressed in the Preface of the Nativity: "For by the mystery of the Word made flesh the light of Thy glory hath shone anew upon the eyes of our mind; so that while we acknowledge Him a God seen by men, we may be drawn by Him to the love of things unseen." During the Christmas season there is an extensive exchange of greetings and good wishes among friends. These greetings are a reminder of those "good tidings of great joy that shall be to all the people, for this day is born to you a Savior Who is Christ the Lord" (Lk. 2:11). They are a reminder, too, that all blessings and graces come to us from Christ: "Hath He not also with Him given us all things?" (Rom. 8:32). During the Christmas season there is also an exchange of gifts. This custom should recall to us that on this day God Himself gave to us the greatest of all gifts, His beloved Son: "God so loved the world as to give His only begotten Son" (John 3: 16). The Christmas tree, of which the first-known mention was made in 1605 at Strasbourg, was introduced into France and England in 1840. It symbolizes the great family tree of Christ which through David and Jesse has its roots in Abraham, the father of the chosen race. It is often laden with gifts to remind us that Christmas brought us the priceless gifts of grace and of eternal life. It is frequently adorned with lights that recall to us that Christ is the Light of the world enlightening those who sit in darkness and in the shadow of death. Though not entirely unknown before, the custom of the Christmas Crib was adopted by St. Francis of Assisi at Greccio, Italy, on Christmas 1225. It is a concrete and vivid way of representing to ourselves the Incarnation and birth of Christ. It depicts in a striking manner the virtues of the newborn Savior, especially His humility, poverty, and charity. Catholic Culture offers these links to help you experience the joy of Christmas by keeping a spiritual focus on the season. Throughout this wonderful time there will always be much hustle and bustle, shopping and baking and gift giving. But we hope you will refer to the Catholic Culture calendar often for ideas and spiritual nuggets to increase your Christmas joy. Let us try to celebrate Christmas with the innocence and humility of children always keeping in mind the wonderful birth of the Christ Child. The purest of Virgins gave us our God, who was this day born of her, clothed in the flesh of a Babe, and she was found worthy to feed him at her Breast: let us all adore Christ, who came to save us. Ye faithful people, let us all rejoice, for our Savior is born in our world: this Day there has been born the Son of the great Mother, and she yet a pure Virgin. 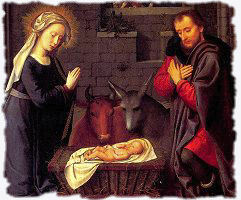 Today is the great solemnity that shows the world that the Word incarnate, the Savior of mankind, is finally born. God becoming truly man is an enormous event [….]. Something truly happens that goes beyond any evolutionary process: the fusion of man and God, the creature and the Creator. It is not the progression of another step in the evolutionary process, but the eruption of a personal action, founded on love, that from this point forward reveals to men new space and possibilities. (Joseph Ratzinger in God and the World: A Conversation with Peter Seewald, 2001, p. 197). Christmas says to us: alone we can’t profoundly change the world to remedy it. Alone, we can make the world better or worse, but we can’t save it. Christ came therefore, because left to ourselves; we couldn’t escape the ‘mortal disease’ that has enveloped us from the first moment of conception in our mother’s womb. This gives us hope, true hope, and true Christian optimism: I can’t do it but He is there! This is the mystery of grace synthesized in the human figure of God incarnate. Christmas Eve and Christmas day are moments of contemplation. We consider, in many dimensions, the mystery of love that was incarnated for us. First of all, we contemplate the light and joy, without forgetting Jesus and Mary’s sorrows and sufferings, and the many difficulties that had surrounded them: the cold, the uncomfortable place, the dangers….. It would be good to accompany these thoughts by reciting and meditating slowly on the Holy Rosary, preferably in front of a crib. ‘Blessed grotto of Bethlehem that testified to the wonders! Who, in this hour would not turn our hearts? Who would not prefer the opulent palace of the King?’ (P. Guéranger, L’Anno Liturgico, Alba 1959 [orig. franc. 1841], I, p122). Christmas also reminds us of the great mystery of God’s people, of the Church acquired through Christ’s blood, animated by the life giving Spirit, governed by the legitimate shepherds in communion with the successor of Peter. On this day in which the Word came to earth, assuming human nature, body, and soul, how can we not think about His Mystical Body that is animated by the Holy Spirit? ‘For this reason, by no weak analogy, [the Church] is compared to the mystery of the incarnate Word. As the assumed nature inseparably united to Him, serves the divine Word as a living organ of salvation, so, in a similar way, does the visible social structure of the Church serve the Spirit of Christ, who vivifies it, in the building up of the body’ (Vatican II, Lumen Gentium, n.8). Holy Christmas also reminds us of the mystery of Mary as Mother of God, mother of the Incarnated Word, and mother of His mystical body, the Church. Christmas encourages us to contemplate Jesus together with Mary, reflecting on Jesus with ‘His mother’, as recounted many times in the Gospels. If our faith must be fully evangelical, it can not neglect a sane and profound devotion to the Mother of God, as she shows us the easiest way to reach Jesus. Our second duty is to recognized Jesus as true Man in His "earthly" or temporal birth as "Son of Mary." Our third duty is to realize more and more the "spiritual" birth of Jesus in our souls at the time of our Baptism. Then were we "Christened, " reborn as members of His Mystical Body. We must grown with Him during the coming year, by "rejecting ungodliness," by pursuing good works" (Epistle).